In January I booked flights to Tampa from Manchester, NH, (where my friend Kristin is flying from), and Durham, NC, (where I’m flying from) on Southwest, and both were about $200 round-trip. Not bad for Easter weekend! But get this. Car rentals from the airport for five days were around $500!! Unbelievable. Here’s what I did. As you probably know, Enterprise has little neighborhood offices all over the place, and they’re often (usually? always?) cheaper than airport rentals. I reserved a car at a location on my way to where I’ll be staying (Indian Rocks Beach). I’m paying a mere $30 extra to then drop it off at the airport when I leave. The grand total? $156!! Now that is a deal. 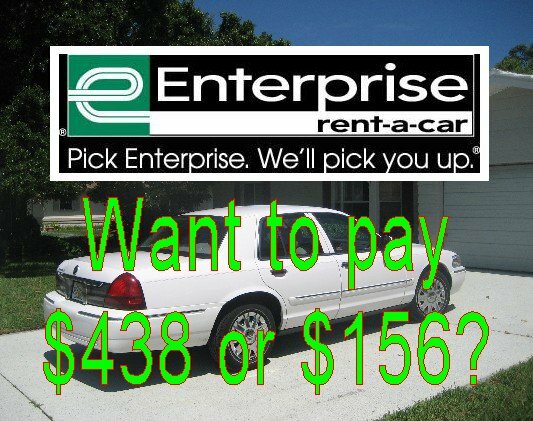 If I picked the car up at the airport, still using Enterprise, the price would be $438. Other companies were charging even more!! To do this fancy-schmancy different drop-off reserving, you have to call, not go online. But then Enterprise *offered* to give me the online price, saving me another whopping $5. Enterprise is tops in car-rental customer service, and I’ve been saying this for years, not just since my $275 savings. I’ll probably be able to get a ride from the airport to Enterprise, but if I couldn’t, a Super Shuttle ride for about $20 (including tip) would take me straight to Enterprise. My scenario may not exactly suit your needs. For example, you could use a neighborhood Enterprise office in Tampa and be even closer. If you’re traveling in a group or family, it would be cheaper to take a taxi than pay for individual shuttles. My main message here is that when prices are jacked up, try to rent away from the airport. Get creative! This entry was posted on February 1, 2008 at 2:11 pm and is filed under Car rentals, Florida, Road travel, Travel consumer issues. You can follow any responses to this entry through the RSS 2.0 feed. You can leave a response, or trackback from your own site. What a great tip. I had no idea…thanks! Yup.. great tips. Spot on….